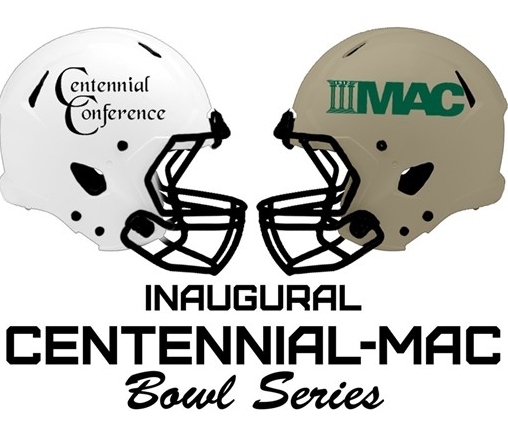 DOYLESTOWN (PA) – The Centennial Conference and the Middle Atlantic Conference (MAC) announced the match-ups for its Inaugural Centennial-MAC Bowl Series and Delaware Valley University will host Moravian College in one of the meetings on Saturday, November 21. UPDATE: Kickoff is set for 12:00 p.m.
Muhlenberg will host Stevenson University in the other Centennial-MAC Bowl contest. The kickoff times of both games will be decided in a conference call with the participating institutions on Monday morning. With the Eastern College Athletic Conference (ECAC) moving all of it bowl games to Connecticut this year, schools in both the Centennial and the MAC felt that they would suffer significant financial impact. Therefore, the conferences came together for the new arrangement that still provides postseason opportunities while controlling costs (NCAA rules permit a conference-sponsored postseason tournament – one between teams that are not identified until the end of the preceding regular season – not to exceed one contest for any one institution). The set-up has the top team from each conference that was not selected to the NCAA Division III Championship hosting the second best team from the opposing conference not moving on to NCAAs. That's the case for DelVal as the Aggies finished the regular season with an 8-2 overall record, 7-2 and in second place behind NCAA qualifier Albright. It marks the 12th time in the last 13 years that DelVal has reached the postseason thanks to six NCAA berths, five ECAC Bowl games and the inaugural Centennial-MAC Bowl. The Aggies clinched the berth and a home game with Saturday's 20-3 triumph over archrival Widener University. Moravian (8-2 overall, 7-2 Centennial), a former MAC school, trailed NCAA qualifier Johns Hopkins and Muhlenberg in the Centennial standings. The Greyhounds are coming off a 28-14 loss at Muhlenberg. They last met DelVal in '06 and the suffered a 39-0 setback in Doylestown.